Our rates have changed. Please read below. 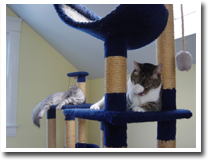 Even if your cat has never stayed in a cat hotel around other cats we recommend they try Group Play Rooms. We have two spacious Group Rooms. Each receive most of their light naturally from windows. There are lots of places to climb, run or lie quietly in the sun. Drop by for a tour any time you like or look around on our controllable web cameras. 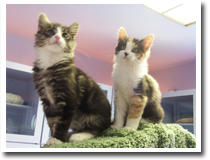 Our Group Play rate is $41 per day for one cat and each day one meal of canned and unlimited dry house feline fare is included in the boarding rate. * Group Play discounts are available for multiple cats and/or pre-booked stays of 28 days, pre-booked pre-paid at time of drop off. 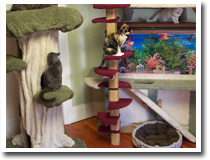 This is Totally Cage Free Cat Boarding with floor to ceiling cat trees, cat walks all around the room, access to the enclosed outdoor sun porch for a completely safe outdoor experience and a large fish tank providing hours of entertainment. Watch Nemo our long time resident goldfish (he just flitted by) or see who's up in the cat walks keeping an eye out from above. The Sun Porch is part of the Downstairs Group Room experience and is open all day during all but the most inclement weather. 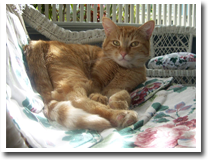 Cats love to watch the birds and people outside or just lounge the day away in the cat-sized wicker furniture. Our Upstairs Group Room is set aside for indoor only kitties or cats who like a bit more personal space. It is totally Cage Free Cat Boarding with many cat trees, live cockateils, and a large fish tank for spellbound gazing. East and West facing windows provide plenty of natural light. For cats who can't interact with other cats we have Private Condos available. These Condos are quiet and tranquil and perfect for special needs kitties. We can link up to 4 Condos together, depending upon the space available, to give your cat more space. Each cat that has a negative result of a FIV/FeLV blood test within 12 months like each cat in a group playroom spends part of the day inside the Private Condo and part in the open play area. Cats in Private Condos never come into contact with cats outside their family. The play area has opportunities for climbing and a cozy window nook. The very best in luxury cat boarding is now available to owners who don't want their cats to mix with other cats. A current FVRCP vaccine is required for the Private Room. Click HERE to download our test/vaccine requirements sheet. Our Private Condo rate is $47 per night for one cat. Each day one meal of canned and unlimited dry house feline fare is included in the boarding rate. * Discounts are available for multiple cats and/or stays of 28 days, pre-booked and pre-paid at time of drop off. * We require prepayment at the time of drop off. The Private accommodation rates increase during peak periods, described on our contact page. Please feel free to call us, (626) 356-2287, or email us, Pasadena@TheBestLittleCatHouse.com, for personal service.